There was a welcome sight at Steel Park last weekend as Corby Town assistant-manager David Clarke was on hand to watch a game for the first time since he was diagnosed with leukaemia. Tommy Wright’s right-hand man was in the stands to see the Steelmen beaten 2-1 at home by AFC Fylde, who moved to the top of the Vanarama National League North as a result. Clarke is currently undergoing chemotherapy treatment as he battles leukaemia. 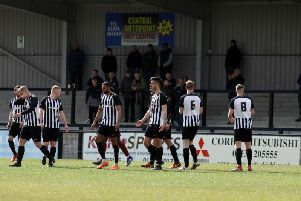 And, despite Corby’s struggles on the pitch on recent weeks with a run that has seen them go 11 games without a win while also dropping into the bottom three, the assistant-manager saw enough last weekend to suggest things will soon change for the better. Clarke also gave an update on his own condition and said: “I am okay, I have good days and bad days. “The chemotherapy I am taking is strong obviously and it does take its toll. “But I am not the sort of person to sit in the corner and start crying and moaning about it. “If I can come here and face up to my problems then why can’t the football team face up to their own ones? “So let’s face up to this and do the best that we can to get out of it. That’s all you can do sometimes. “There are a few new faces around and Tommy is trying his hardest to get things right. “It’s going in the right direction. “All I have been doing is watching the highlights and, after watching the game last weekend, it’s not as bad as people have been saying. Wright, who is now preparing his team for a re-arranged home clash with Curzon Ashton this Saturday, was delighted to see Clarke at the game and he believes his presence was felt by the squad as they turned in a much-improved display, despite suffering another loss. “Dave only lives round the corner from me so I can see him whenever I want,” Wright said.